If you’re looking to boost your financial returns and make more money, are interested in alternative investments and would like quick access to your newfound cash, consider peer-to-peer lending. One of the fastest growing companies in Europe’s peer-to-peer lending industry is Latvia-based TWINO. Roberts Lasovskis, TWINO Investment platform lead, spoke to RewardExpert. “At TWINO we connect investors seeking premium returns with borrowers searching for convenient loans, through the digital landscape. Our disruptive platform has democratized an investment process that was previously only accessible to the prosperous few,” he said. Peer-to-peer lending (commonly known as P2P) benefits both people seeking capital and people seeking to make extra money. It benefits borrowers by giving them greater access to funds. It benefits investors by opening up a new avenue to create greater financial returns by lending to their peers through an online marketplace such as TWINO. “The key advantage is that we offer very predictable high-yield returns that are extremely liquid. The investors have the possibility to withdraw their investments in a matter of days while keeping the earned interest and without any penalty fees, which is unique in investing,” said Lasovskis, who mentioned that TWINO investors have historically netted returns of approximately 12%. Investors hunting for more yield on their money have been turning to peer-to-peer lending. “The traditional asset classes have definitely lost some of the allure, while the peer-to-peer lending has proven to be very reliable and high-yield generating alternative option of an investment portfolio,” stated Lasovskis. Loan terms vary from as short as one month to terms lasting longer than one year. While all investments involve risk, TWINO is committed to giving each user a positive investment experience. Currency risk is monitored and evaluated by TWINO employees and currently all loans are issued in either Euros or Pound Sterling. In addition, safeguards are in place in case an investor does not pay back their loans. “We have introduced investor protection guarantees that ensure that investors receive their invested principal and interest even in the unlikely case, when the borrower stops paying his/her repayments,” said Lasovskis. TWINO recommends that investors split up their investment into several loans, to decrease risk and maximize the opportunity to earn more money. Also, TWINO does not charge user fees and makes its profits from the spread of the interest rate charged to borrowers and the interest rate offered to investors. Besides its desktop applications, TWINO also offers a suite of mobile apps, designed for lenders who are often on the go. “A major part of TWINO investors are tech-savvy individuals who are in their 20s or 30s; therefore, we have launched our iOS mobile application almost a year ago. This has proven to be a great choice and with that on mind we are taking the next steps by launching the first version of our Android application very soon,” said Lasovskis. Besides growing investor bank accounts, TWINO has been posting some big growth of its own. 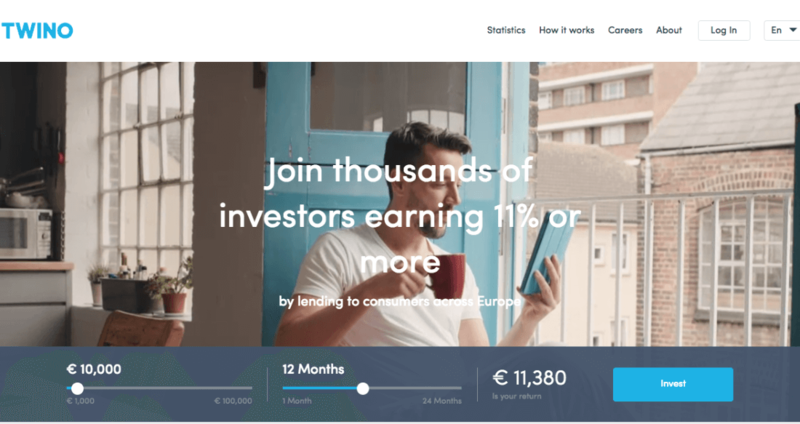 Since launching its investment platform in 2015, it has originated more than 200 million Euros worth of loans and currently has over 11,000 active users, with the majority coming from Germany, the United Kingdom, Estonia and Latvia. While TWINO operates primarily in Eastern Europe, the company has high hopes for expansion, especially as financial tech regulations become clearer. “In order for challenger banks to operate internationally, there will need to be internationally ratified agreements and legislation allowing them to do so. Closer alignment at a regulatory level will facilitate this international development and it may well be that a partnership with a traditional bank ultimately drives this next level of development,” stated Lasovskis. For more information, visit www.twino.eu.